Allergan (NYSE:AGN) is sitting at a crucial period in the company’s history. The stock has declined by over 45% since its peak in 2015, and activist shareholders have begun to get more involved with public calls for board changes and a strategic plan. Going forward, Allergan will see a number of important readouts and events that could determine the fate of the company. An important set of readouts will come from competitors for Botox Aesthetics. The readouts of these drugs and any earlier-than-expected entrance will put pressure on Botox Aesthetics’ sales, which represented 9% of total sales. Additionally, the company will see several crucial readouts for a number of drugs in the pipeline over the coming months that will either make its future look more bright or more bleak. If the latter scenario plays out, activist calls for drastic changes will become louder. Botox Aesthetics will soon see branded competition enter the market. The first competitor that could potentially come to market is Evolus (NASDAQ:EOLS) with DWP-450. In mid-May, the company received a CRL related to its manufacturing processes. Evolus now has a new Spring 2019 target, but some investors believe that the drug could come to market as soon as October this year, if all goes to plan. Another competitor that investors are closely watching is Revance’s (NASDAQ:RVNC) RT002. Revance’s Phase 3 trials showed a 6-month duration, which will likely prove to be a strong differentiating factor to Botox (which has a 3-4 month duration). Revance notes that it is on track to file by 1H19, with a potential launch in 2020. Finally, Hugel is already on the market in Korea, and is expected to have a phase 3 readout in August. The company hopes to launch the drug in late 2019. With a slew of competitors nearing a launch, there is headline risk that could put pressure on the stock as these drugs get closer to their launch. Investors are also debating the impact these launches could have on Botox growth and whether consensus estimates are properly accounting for the impact of competitors in the market. Management believes that Botox Aesthetic can grow in the high single digits despite the competition. Currently, consensus estimates have growth for Botox Aesthetics slowing from 11% in 2018 to 8% in 2019, and 7% in 2020. Beyond Botox Aesthetics, investors are also watching Botox Migraine and Restasis. Botox Migraine will face volatility as the CGRPs enter the market (with Amgen’s (NASDAQ:AMGN) Aimovig already launched and Eli Lilly (NYSE:LLY) / Teva (NYSE:TEVA) entering in 2H18). Restasis will face a number of generics from Mylan (NASDAQ:MYL), Akorn (NASDAQ:AKRX), and Teva, and management is planning on increased competition in 2H18. Any delays to competition could provide upside, while earlier launches or signs of traction would provide downside. The first set of crucial catalysts is expected to come from Allergan’s ubrogepant. Recall that there are currently three competitor anti-CGRPs (all injectables) that are about to enter the market for migraines. Allergan has two oral anti-CGRPs in the pipeline, ubrogepant and atogepant, each with the potential to reach one billion in sales. Ubrogepant is a short-acting drug targeting acute treatment, while atogepant is longer-acting and targeting prophylaxis treatment. Ubrogepant will have two readouts in 2H18 that will examine Ubrogepant’s safety and efficacy. Efficacy has already been shown with two prior pivotal trials (with efficacy in line with other acute migraine treatments), and is therefore less of a concern. Safety, however, is more of a concern, as one of the single dose trials showed signs of liver toxicity. Allergan is looking at a potential submission in 2019 and a launch in 2020. Patient readouts are expected in September/October 2018, while the healthy volunteer trial is more broadly expected in 2H18. The readouts could determine the likelihood of a 2020 launch for ubrogepant. Atogepant already received positive news earlier in June with a positive Phase 2b/3 readout that showed strong efficacy and safety results. The two drugs are increasingly looking more viable and could provide more upside and perceived value to Allergan’s pipeline. Another catalyst is expected to come from Allergan’s abicipar. Abicipar is a drug for age-related macular degeneration (AMD). Investors have largely written off abicipar after management noted that the first generation of the drug would have material inflammation. This would represent a large flaw given that competitor drugs like Regeneron’s (NASDAQ:REGN) Eylea and Roche’s (OTCQX:RHHBY) Lucentis have much cleaner records. In fact, the inflammation signal, as well as the strong efficacy results for Eylea and Lucentis, were factors that led investors to believe that current management was making a mistake in pushing the trial forward. However, while investors do not expect results to be strong, if Allergan is able to show lower inflammation signals and strong efficacy, the stock could move higher given that consensus expectations are so low for abicipar. The market for AMD is estimated at $6+ billion, and existing treatments are unpleasant intraocular injections, leaving room for a competitor with a longer duration. Readouts are expected within the next 1-2 months. Allergan’s third catalyst is Rapastinel, an IV injection for acute treatment of major treatment-resistant depression. Rapastinel has shown the potential to have improved safety within the ketamine class, as Phase 2 results have shown no euphoria effects. The drug is in pivotal trials, and management expects to have readouts in early 2019. Additionally, the drug has the potential to expand into suicidal ideation, which is a huge market and has potential for $2+ billion in sales. 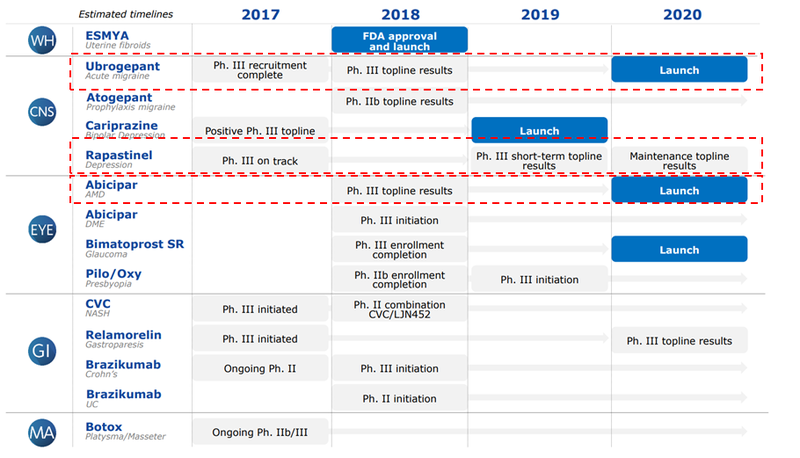 Other pipeline drugs of interest among investors include Esmya (which has an upcoming PDUFA date in August) and bimatoprost SR (which just saw a positive phase 3 readout in June). Beyond these drugs, Allergan will have several other upcoming events that could provide more clarity on the company’s strategy and the current state of its pipeline, which is the subject of heavy debate among investors. The company will have an Aesthetics analyst meeting in mid-September and an R&D day in 4Q18. This post originally appeared on The Non-Consensus. Previous articleiQIYI: Time To Pile In?